I am restoring the Bob Mcginty Camaro that was yellow and black #78, 48. When I got the car in 1983 it was painted Lime Green and Yellow saying "Sungro" owned by Don Smith. I would appreciate if any one can supply any info or have any pictures of the car. Bob, thanks for signing up and joining the forum. I'm excited to hear about you restoring Bob McGinty's old car. Maybe 12-15 years ago I was looking at the Firebird/Camaro that Rick Titus owned. It was at Chuck Beck's shop near Phelan, CA. While I was there, Chuck Beck told me that he was the one who built the car for McGinty and the work was done at an Oldsmobile dealership that had gone out of business. It was somewhere in the LA area but I don't remember the exact town. Here's a little blurb about Chuck Beck... http://www.examiner.com/article/chuck-beck-celebrates-75th-with-another-atlanta-garage-party . If you look at Chuck's website, http://www.beck904.com/ , you'll find a phone number for him. It appears that he is now located in the Atlanta, GA area. I've got a few pics of the car. Here's a very lousy one from the Finish Line publication in late '72. It appears that it may have the same paint scheme as the lower picture you posted above. 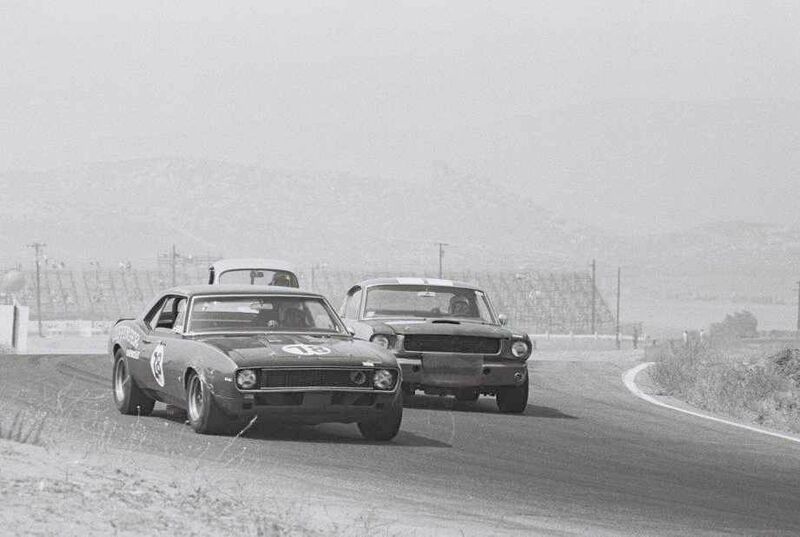 The earliest photo I have seen of the car was taken in March '68 at Willow Springs. It looks like it was an RS/SS originally. 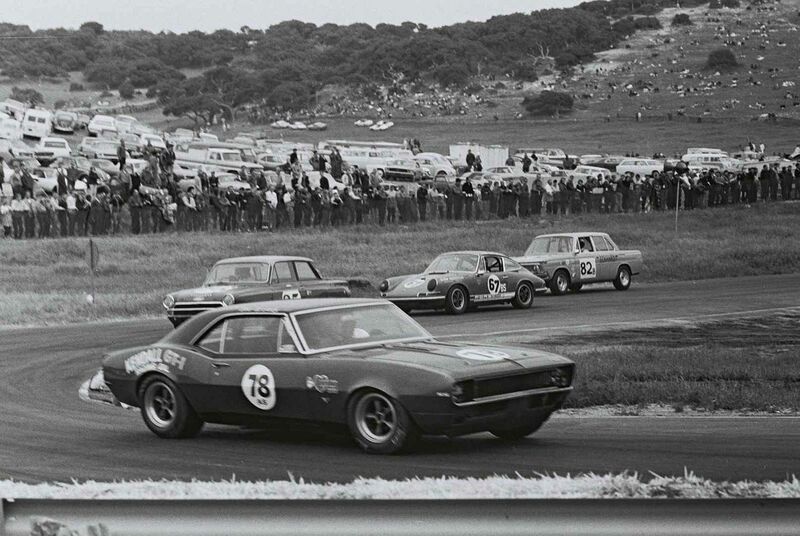 The car was repaint green and black by the time it was entered in this support race for the USRRC event at Laguna Seca in May '68. 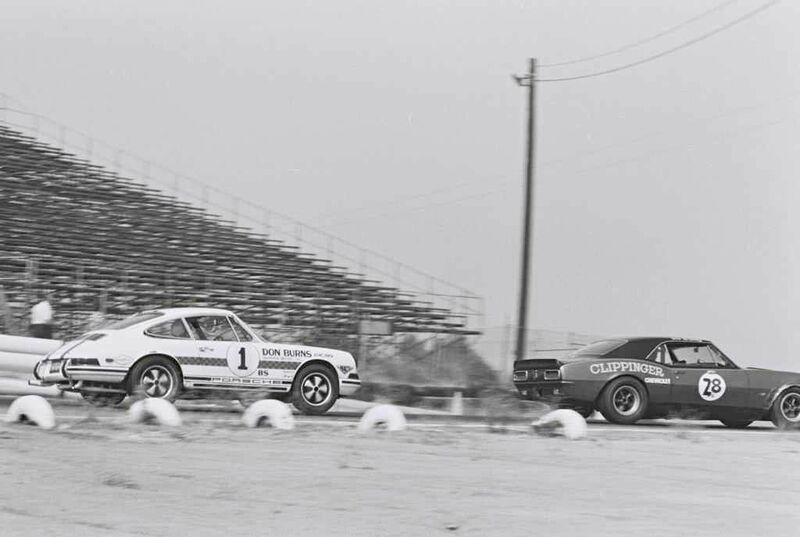 It got sponsorship from Clippinger Chevrolet in Covina, CA by the time it ran in this Riverside A/Sedan race in July '68. Here's another shot from the same 7/68 Riverside event. 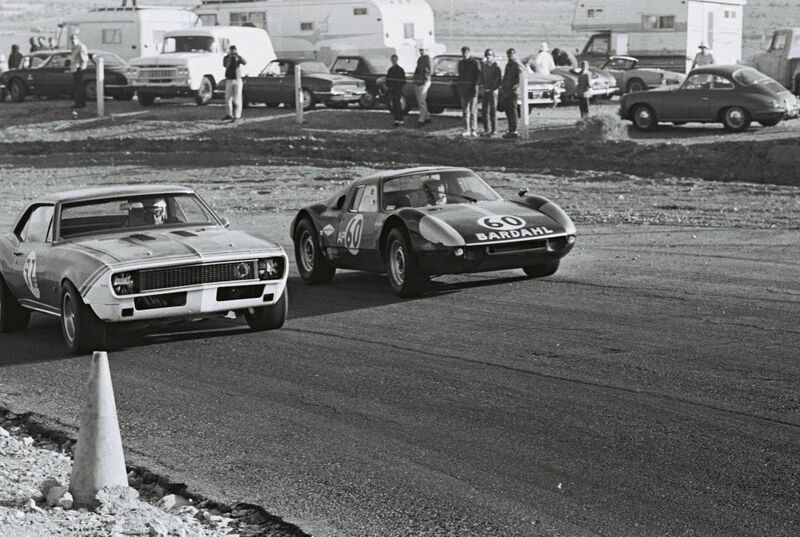 Here's McGinty's car and Donohue's Penske Camaro in turn 7 at the Riverside Trans-Am race in September '68. The car has switched to a flat hood and standard Camaro grille by this point. 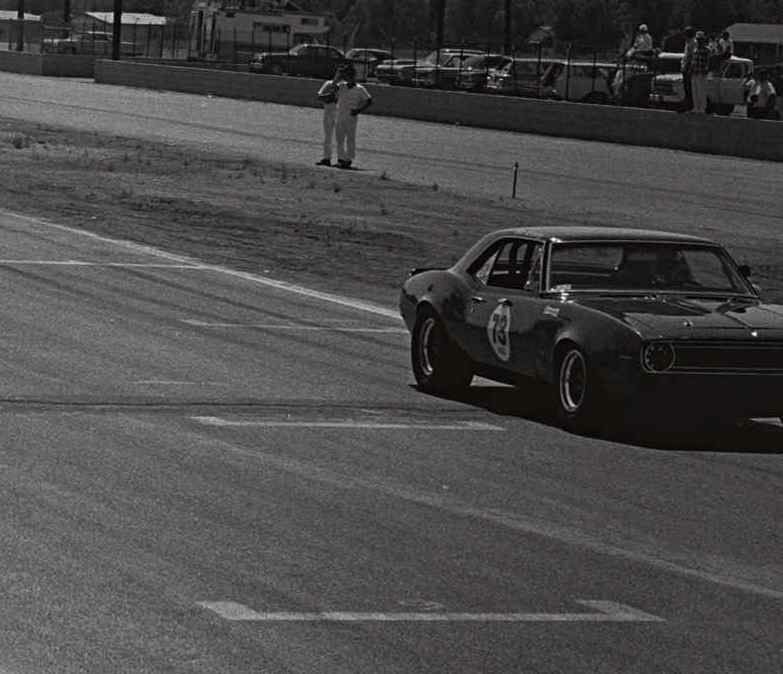 Here's another shot from the '68 Riverside Trans-Am. Thanks for the pictures and info, I really appreciate it. I wish I could find more pictures if any of the Don Smith version of the car as I have no images while running in those colors. As of now I just sent the car off to a guy in Pomona to get new quarters installed and flare them. In regards to Chuck Beck involvement, I knew he had a hand in the car and I saw his shop at cable airport in Upland, Ca. I saw the Titus Firebird in the background at the time, but I can't recall when this occurred. I can only date this event when Beck built the Lister with the crate engine with 58 mm Crossed Webers on the engine. Here are some current pictures of the car in Dec 2014. I have all kinds of pictures of the car as a work in progress, but the biggest thing is to get the quarters and back end fixed up to move on from there. In the Last few years I have started to concentrate on finishing the car and redid the firewall (involving lots of welding up pin holes and all over interior of car) I painted interior after sanding off rust and painted firewall and inner fenders and underside of car. I finally installed the front sub frame and assembled most of the suspension pieces. Redid the fuel cell to hold my future to be determined fuel cell... I installed the dash from stock panels I found at a swap meet since it was missing when I bought it. I will be glad to get the car back and continue more of the installation process and body work. Bob, thanks for posting some current pics. Nice to see and hear of the progress being made on it. I don't believe I have any pics of it when owned by Bob Smith. Is that the paint scheme you're going with or are you going for the earlier look? I have been meaning to get around to posting some info and pictures on the car for a while and I am glad I finally got around to doing it. I want to get in contact with Mcginty while I can to further discuss about the car. I appreciate what you do have, since I have so few pictures. I really would like to have the car painted back to the black and yellow paint scheme, but my son would prefer the black and green colors so I don't know which direction I will go for now.. I have not fully looked into the full history of the car as to what it started out as from the factory. From my knowledge, the car was acquired from Mcginty from a bank repo to which I figured the car was a standard Camaro and not an RS/SS, but from the early pictures it sure looks like it was an RS/SS. I know the factory colors were a bright blue from digging down through all those layers of paint. The doors gave the most info to all the colors it has been over the years. I don't believe the hood nor the lower valance have blue on them, which was another reason why I thought the car was standard from having a flat hood and a standard lower valance. I have kept every panel and part I bought the car as, which were pretty damaged and pretty crude in how things were cut, drilled and designed. I found this picture on facebook. Ahh, I just happened upon that image just browsing the web the other night, which spurred my interest in searching for more images. Its a very good image and I was surprised when I saw it. I messaged the guy, Jerry Britain on facebook about the car since he briefly discussed the car. He has not replied back yet. That's a nice shot of the car in color. Thanks for posting it, Mike. The car also sports a RS tail panel. One of the things I remember Chuck Beck telling me about the car was that he made solid bushings to put between the subframe and body and then wrapped black electrical tape around them so they would look like the stock rubber bushings. Solid sub frame bushiings not allowed? I thought that was ok. I thought so also but it helped me remember the story as I thought, "why bother?". How will it be restored, RS? SS? yellow or green? It will most likely be restored with standard body panels even though I have some SS parts for it. I will try some combination of green and yellow, but it will be black on top.